Looking for something to do? 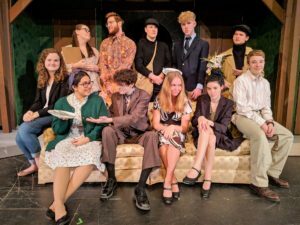 Well Penn Manor’s fall play “Noises Off” is coming up this weekend and it’s a show you do not want to miss. Michael Frayn’s chaotic comedy “Noises Off” takes a look at a group of actors and actresses and how their egos, passionate affairs and memory loss turn their stressful performance into a high-risk adventure. This play-within-a-play captures a production of “Nothing On” in three stages: dress rehearsal, the opening performance, and a performance. “Noises Off” is a delightful backstage buffoonery, complete with slamming doors, falling trousers, and -of course- flying sardines. There are about 40 students working on various crews and 11 cast members working hard to make this show the best it can be. The play is directed by Carole Shellenberger. The show’s play within a play format challenges the actors to play two different characters. “It’s really hard and very difficult having to time our conversations perfectly, but I have a feeling that it will click,” said junior True Herbert, the actor who plays Garry who in turn plays a character named Roger. The cast also worked on British accents. As for the crew members, they are working hard to get all the flying sardines they need to give the show its comical aspect. Students have worked hard on all areas of putting on a production, including designing and building the set, makeup and costumes for the actors, sound and lighting, and marketing and promotion. Shows will be at 7:30 p.m. Nov. 16-17. All seats are reserved, and tickets can be bought online here.